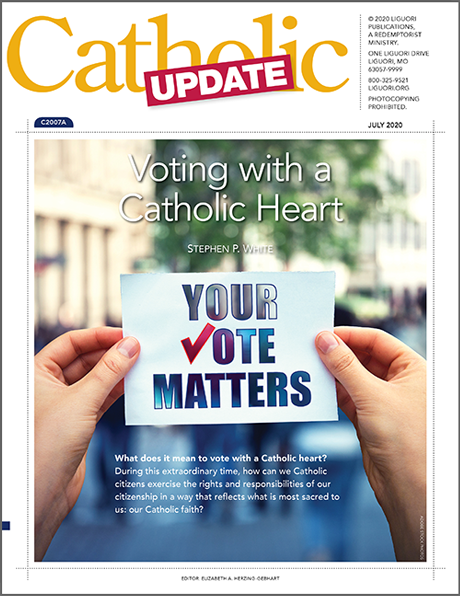 A subscription to Catholic Update is an excellent way to encourage your parishioners to grow in their understanding and appreciation of their Catholic faith. A ready-made bulletin insert gives parishioners an enriching article to take home from Sunday mass. Practical and relevant topics for catechists, catechumens, or anyone interested in key topics of the Catholic faith. A great starting point for small group discussions. A Digital Library subscription to Catholic Update provides instant access to more than 240 digital issues, with the newest issue added each month*. With a subscription to the Catholic Update Digital Library, you have the ability to print and share links to all of the flipbooks in the digital collection. *Please note: Most, but not all Catholic Update newsletters that are available in print are included in the Digital Library. Updated and revised back issues of Catholic Update are added on a regular basis. For digital subscriptions, payment is due at the time you place your order. Please call 1-800-325-9521 if you have questions or need assistance. Click here for digital FAQs. How can I use Catholic Update? A ready-made bulletin insert gives parishioners an enriching article to take home from Sunday mass. As a handout, it's a practical and relevent resource for catechists, catechumens, or anyone interested in key topics of our faith. Use as a starting point for discussions in small groups. Why should our parish or group subscribe to Catholic Update? A new topic each month explores a key aspect of our Catholic faith or a current topic of importance to Catholics. Written in everyday language to help your parishioners connect Church teaching to daily life. Quality content that you can trust: each issue of Catholic Update has an imprimatur, so you can be sure that it's free of doctrinal error. How would we use Catholic Update? Distribute it to every parishioner: through the mail, as a bulletin insert, or placed near the doors of church for easy pick up after mass. Create a monthly discussion group to explore the topic covered in each issue. Give it to your parish catechists and Catholic school teachers as an ongoing formation tool. Use it in RCIA sessions. A subscription to Catholic Update is a cost-effective choice for parishes and groups of all sizes. Print Subscribers: Take advantage of bulk subscription rates to help you inspire and inform your parishioners. A one-year print subscription includes 12 issues--and includes our popular Advent and Lent issues. Subscribe for each member of a small group, order enough for catechists and Catholic school teachers, purchase enough copies to make Catholic Update available to the entire parish. Call us at 800-325-9521. One of our customer service reps will be happy to send you a complimentary issue and answer any questions you might have. Due to the volume of orders, your monthly shipment quantity cannot be changed during your subscription year. If you would like to order additional copies at any time, please call 800-325-9521. Our business hours are 8:00 am to 5:00 pm CT.
Payment is due at the time of order. Billing is available for monthly order quantities of 100 or more. For billing arrangements, please call 800-325-9521, 8:00 am to 5:00 pm CT.